Lauran Drackett holds a Bachelor of Arts in Communication, Major in Dance from Northwestern University. She has trained with Aerial Dance Chicago (ADC), Actors Gymnasium, Diavolo Dance Theatre and the Paul Taylor Dance Company. 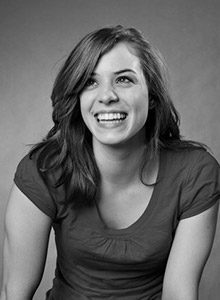 From 2009 – 2011 Lauran was a dancer, choreographer, and assistant teacher with ADC and served on the board in 2016. From 2011 – 2015 Lauran performed with Innervation Dance Cooperative, J Lindsay Brown, among others in the Chicago area. After moving to Seattle in 2016, Lauran began taking aerial classes with The Cabiri and most recently performed in their annual dessert theater event Ghost Game XI: Beyond the Veil (2017). When not performing, you can find Lauran working in the Preparatory Dance Program at Cornish College of the Arts or exploring the mountains with her husband Nate, and rescue dog Balto.